Starting on April 2, 2019, the Fisheries Pool and Atnarko campgrounds at Tweedsmuir Provincial Park South will offer campsite reservations via our Discover Camping reservation service. Nuxalk-Carrier Grease/Alexander Mackenzie Heritage Trail north of the Boyd Pass Trail is closed due to 2018 fire damage. Due to 2017 wildfire activity, significant flood risk hazard and debris flow hazard exists at drainages along the Tote Rd. Park visitors should avoid travelling on the Tote Rd during high water or rain events. Tote Road is driveable by 4x4 high clearance only. Stillwater lake trail is open. In the interest of public safety and for the protection of critical bear habitat, certain areas in the park are closed during the bear viewing season. Please check “Know Before You Go” section below for details. For further information, please contact Mattias Morrison, Bella Coola Area Senior Park Ranger, at 250 982-2701 ext. 2. Tweedsmuir Provincial Park – South is one of the largest of B.C.’s several hundred parks. Located in the west-central region of the province, 480 km northwest of Vancouver as the crow flies, Tweedsmuir is roughly triangular in shape. It is bounded on the north and northwest by the Ootsa-Whitesail Lakes reservoir, on the west and southwest by the Coast Mountains, and on the east by the Interior Plateau. The Atnarko and Bella Coola Valleys provide critical habitat for bears and people need to be bear aware. Areas of the park are open to hunting during allotted seasons. Please consult and obey the British Columbia Hunting Regulations. Winter recreation is also popular at Tweedsmuir Provincial Park. Tweedsmuir Provincial Park – South is partnered with Tweedsmuir Provincial Park – North. Special Features: Shield volcanoes, Hunlen Falls, canoe chain and grizzly bears. Park Size: 989,616 hectares for the southern portion of Tweedsmuir Park. The backcountry of Tweedsmuir Provincial Park is an isolated wilderness with infrequent patrols by park staff. You should be experienced in wilderness travel, fit and well equipped. Snow is possible any month of the year in the mountains. If you plan to hike overnight or longer you should inform a responsible person or agency of your intentions, including estimated return time and destination. As in any wilderness setting, persons should be prepared to be self-sufficient. For those new to the wilderness adventure tour, guides are available in the area. Weather conditions in the park are as variable as the topography. Moderate temperatures and extensive rainfall characterize the lower reaches of the Bella Coola Valley. At Stuie near the junction of the Atnarko and Bella Coola Rivers, there is an average annual precipitation of 720 mm with about 20% of this being in the form of snow. The interior plateau receives a greater proportion of snow and its winters are more severe. Temperatures in the southern section of the park can drop to -40°C in January and reach 30°C in July. Summers are usually fairly dry with June, September and October being the wettest months. Grizzly and black bears range throughout the park, and grizzlies congregate on the Dean and Atnarko, and Bella Coola Rivers between May and October when salmon are in the river. People should be particularly cautious when fishing, hiking, and camping. Please read the BC Parks Bear safety information. Get more information on bear safety at Tweedsmuir [PDF]. Peak viewing season September 1 to October 15. Belarko bear viewing platform operates September 1st to September 30. Includes all areas upstream of fish counting tower and sunset bluffs. Commercial recreation opportunities are available for the Turner Lake Chain (canoe rentals) and in and around the Atnarko River. Please visit the following non-government websites. There are further tourist facilities and supplies at Bella Coola, Hagensborg, Nimpo Lake and Anahim Lake. Please consult the British Columbia Accommodation Guide for details. This publication is available from Tourism British Columbia, Parliament Buildings, Victoria, BC, V8V 1X4. Please note: Tote Road is access to the Hotnarko parking area, and is a 4x4 high clearance vehicle only road. Expect rocks, ditches and brushed-in conditions. Please come prepared. Trails in the southern portion of Tweedsmuir Provincial Park are not being regularly maintained. Please be aware users may encounter fallen trees and trail wash outs. Extra caution is advised. Please be aware that Rainbow Range trails are used by both horse users and hikers. Please respect each other’s use. BC Parks has cleared portions of the trail system in the Rainbow Range during the summer of 2016. The portions that have been cleared are: Rainbow Range parking lot to Crystal Lake, Rainbow Range Trail, Boyd Pass to Rainbow Cabin; Tweedsmuir trail from Rainbow Cabin to Octopus Lake, Octopus Lake trail and portions of the Nuxalk Carrier Grease/Alexander Mackenzie Heritage trail from Hump Lake to Hwy 20 and from Rainbow Cabin to the alpine areas. Please note that the remainder of the Nuxalk Carrier Grease/Mackenzie trail has not been maintained and is not recommended at this time. The Rainbow Cabin is in need of repairs at this time and should not be used for accommodation purposes. The Tweedsmuir trail (route) from Octopus Lake to Hwy 20 has not been maintained and is not recommended. The southern portion of Tweedsmuir Provincial Park is located on Highway 20, approximately 400 kilometres west of Williams Lake, midway between Anahim Lake and Bella Coola. The highway from Williams Lake consists of both gravel and paved sections and is well maintained; travel time is between 4 1/2 and 6 hours depending on your destination within the park and road conditions. The "Hill" is the stretch of highway 20 between Heckman Pass and Atnarko campground. It has quite a reputation, since over 16 km it loses over 4000 feet in elevation. Local residents built it in the 1950s, after they had been told by the government of the time that it couldn’t be done. However, nowadays it is well-maintained by highways contractors, and, though steep (up to 18% grades), it is passable throughout the year. The park can also be reached by way of the Discovery Coast passage ferry from Port Hardy on Vancouver Island, or by float plane from Nimpo Lake, Anahim Lake or Bella Coola, or by hiking in the backcountry. You can obtain fuel, basic supplies, and motel accommodation in Anahim Lake or Nimpo Lake. The nearest RCMP office is in Anahim Lake, where there is also a 24-hour medical clinic. The closest hospital is in Bella Coola, over an hour’s drive from the parking lot. National Topographic Series Maps 92N/13, 93C/4, 93/5, 93C/12 and 13, 93D/8E and W and 93D/9 and 16 at a scale of 1:50,000 cover the Tweedsmuir area. These maps are available from most map retailers in British Columbia. For a three to five day canoe trip through spectacular mountain scenery, try the Turner Lake Canoe Circuit, located south of Highway 20. The chain can be accessed via float plane from Nimpo Lake or by exiting Highway 20 onto Tote Road (12 km to trailhead), then by hiking for 16 km along the Hunlen Falls Trail. Canoe rentals and a campsite are available at Turner Lake. The canoe chain comprises approximately 18 km of lakes and 2.5 km of rivers and creeks. The portages are short, with the longest being 1 km. A fee is charged for camping. For more information on canoe rentals and access to the Turner Lake Chain, please check the following non-government website. There are extensive fishing opportunities at this park. Anyone fishing or angling in British Columbia must have an appropriate licence. Rainbow Range – on July 19, a grizzly bear at M Lake Campground approached hikers and gained access to their backpacks. 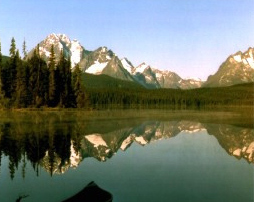 M Lake (McCauley Lake) is located approximately 6 km north of the Rainbow Range Trailhead. Hikers should be prepared with bear spray. Please carry the bear spray accessible on your person at all times. Please report any bear encounters in this area to BC Parks at 250 982-2701, extension 8. Recreational horse use is permissible in the Rainbow Range. This terrain is recommended for experienced riders only (see the Rainbow Range map, which has trails suitable for horses marked as such). The park is open to hunting in certain areas of the park. Please refer to the Hunting & Trapping Regulations Synopsis for more information. If you must bring your pets into the backcountry, they must be kept under control at all times. Backcountry areas are not suitable for dogs or other pets due to wildlife issues and the potential for problems with bears. Swimming is not recommended in the Bella Coola and Atnarko Rivers at the campgrounds. However, the alpine and subalpine lakes you encounter in the backcountry are delightful for swimming (though cold), especially from the white sand beaches of the Turner Lake Canoe Chain. The Atnarko/Highway 20 corridor of Tweedsmuir Provincial Park is an area of excellent bear habitat and healthy populations of both grizzly and black bears. The platform is open from September 1 – September 30, with daily openings starting 7 am – 7pm. There are downhill skiing opportunities in this park; a tow rope is operated by the Tweedsmuir Ski Club on Sundays during the winter. It is located approximately 3 km from the parking lot at the Rainbow Range trailhead. There are approximately 15 km of set cross country skiing trails at the Rainbow Range trailhead during the winter. These are maintained by the Tweedsmuir Ski Club. There are snowmobiling opportunities in the Rainbow Range. There are single-wide car-top boat launches at Fisheries Pool Campground and Belarko boat launch along Highway 20. There is limited space available for parking at both boat launches. The Tweedsmuir Ski Club operates a cabin close to the downhill ski area. Overnight stays can be reserved by calling the club at 250 982-2231. The Rainbow cabin, located in the Mackenzie Valley, is for emergency use only. Free winter camping is permitted in the Rainbow Range parking lot. There is an outhouse, but you must either bring your own drinking water or melt snow. Firewood can be purchased from the park operator at the campgrounds, or you can bring your own wood. Fees for firewood are set locally and may vary. To preserve vegetation and ground cover, please don’t gather firewood from the area around your campsite or elsewhere in the park. Dead wood is an important habitat element for many plants and animals and it adds organic matter to the soil. You can conserve firewood and improve air quality by keeping your campfire small. Limited burning hours or campfire bans may be implemented and some parks may use communal fire rings. Be prepared to bring a portable stove for cooking. If you must have a fire in the backcountry, please burn only dead and down wood and be sure to extinguish the fire fully. Dead wood is an important habitat element for many plants and animals and it adds organic matter to the soil so please use it conservatively, if at all. Be prepared to bring a portable stove for cooking. There are water handpumps in the campgrounds and a water tap at the sani-station; the water at the sani-station is not suitable for drinking. In the backcountry, bring your own drinking water or be prepared to treat surface water, as potable water is not available in the park. This park has 4 picnic areas that have picnic tables and pit toilets. Locations along Highway 20 are (from east to west): at Rainbow Range trailhead, Big Rock/Kettle Pond, Fisheries Pool and Mackenzie Heritage/Grease trailhead. Pit toilets are located throughout the park and flush toilets are located near the sani-station. A sani-station is located near Atnarko campground, and is available during the camping season for a fee.The water at the sani-station is not suitable for drinking or washing. This park offers 24 vehicle accessible and 2 tenting campsites. Campsite reservations are accepted and first-come, first-served sites are also available at this park. Atnarko offers 15 campsites nestled amongst an old-growth forest (on the Atnarko River at the bottom of “the Hill”). These sites are a mix of reservable and first-come, first-served. Fisheries Pool, (situated near Stuie and the site of an old fish hatchery run by DFO), attracts lots of anglers to its 9 high-density open campsites and 2 tenting campsites. These sites are a mix of reservable and first-come, first-served. There is parking available for extra vehicles at the Atnarko campground, but not at Fisheries Pool. It is often difficult for big rigs to turn around when the park is full. If staff are not available when you arrive at the campground, choose your site and pay later. Staff will be at the campground at least once a day during the camping season. The closest store is approximately 50 km away in Hagensborg. There are many primitive campsites dotted throughout the park; please read the hiking page for more details. Some provide facilities such as pit toilets and bear caches; others are more basic. The wilderness sites are open year-round when accessible. In the Rainbow Range and the Ptarmigan Lake areas, the campsites marked on the map have at least minimal facilities – pit toilets and some have bear caches. Please use these sites as you will have less impact on the delicate alpine environment. Please read and observe “Leave No Trace” ethics. At the Turner Lake/Hunlen Falls area, sites are designated, and more developed; bear caches and outhouses are provided. The gate to the Turner Lake Chain is open from June 15 – September 15 and the portage will open dependent on water levels.